Do you want to start an agricultural based business in Bangladesh? We think about farming when we hear the word “agriculture”. That’s because farming is the heart of agricultural based business in this industry. It comes with the various business involves in food and fiber production, such as farming, seed supply, agrichemicals, farm machinery, wholesale and distribution, processing, marketing, and retail sales. It means that there is huge scope for investment in backward and forward linkages in the agriculture sector. Also, there are some other reasons that may involve you with agricultural business. And those main ones are the pivotal role in Bangladesh’s economy and in the lives of the vast majority of its population. Moreover, in the last FY’s Gross Domestic Product (GDP) was crucial in this sector and that’s 20.29%. On the other hand, there is the engagement of about 43.6% of the total labor force of the country. Although Bangladesh is one of the most densely populous countries in the world, it has a population of over 160 million. Also, it will reach up to 200 million by 2050 based on current growth rate. And because of several factors, Bangladesh has enormous opportunities in agro-industries. Besides, it’s predictable that Bangladesh would need an extra $8 billion of these high-value products while using demand projections base on reasonable growth rates in incomes and population according to World Bank. As there are several agricultural based business opportunities available in the agricultural industry, the good thing about the industry is there is a market for all the produce which the industry churns out. Also, researchers and scientist have been reaching for ways to improve crop cultivation over the years. This is especially in the areas where the soil composition and climatic condition does not support the growth of certain crops. And farmers can now yet comfortably grow crops in countries with the recent advancement in technology as a matter of fact. 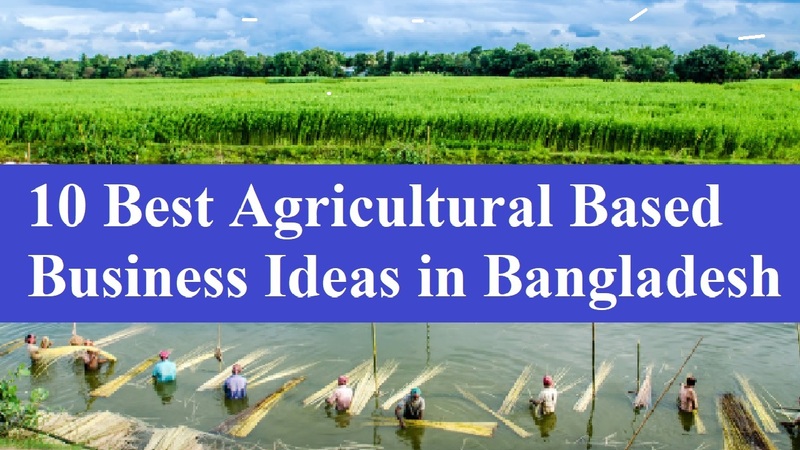 Well, let’s know top 10 best agricultural business ideas in Bangladesh if you have the interest in starting a commercial farming business. Rice is not only a stable food but its favorite in all parts of the world which makes it a good crop to cultivate. One of your best options is to go into rice farming if you’re looking towards starting an agricultural crop cultivation business. The business is most preferable if you live in an area (preferably swampy and watery areas). And the areas that are the soil composition and the climatic conditions support the growth of rice. Also, it’s true that before you make huge profits from rice farming you don’t have to go all the way from cultivation to processing to bagging and to retailing. And you’ll find readily available buyers of raw rice after successful harvesting. The buyers are those who have a factory for processing, bagging and wholesale distribution of rice. As tomato and pepper play prominent roles in the preparation or stew, they are another key agricultural product of Bangladesh. Also, these are the crops that produce irrespective of the part of the world that you live in. moreover, it’s easy to cultivate that’s one good thing about tomatoes and pepper. And there is a large market for tomatoes and pepper as a matter of fact. So, one of your options is to go into the cultivation of tomatoes and pepper if you’re looking at considering an agricultural business idea. Vegetables are favorite all part of the world, not only in Bangladesh. That’s why there is a very large market for vegetables. Thus, one of your options is to go into vegetable farming if you’re looking for starting an agriculturally based business idea. But, you have got to put adequate arrangements to ship your produce to for supply in starting this business. Besides, you should undertake some analysis so that you can understand the best marketing approach. Bangladesh is famous for several types of fruits and some of them are mangoes, litchis, guavas, jackfruits, pawpaw, pineapples, berries etc. Although there is a large market for fruits, that fruits can process into drinks and juice makes it highly sellable. It will be to your advantage to go in fruits cultivation if you have access to a large portion of land. You can do it when there is an area with good soil compositions and good climatic condition. Apart from the fruit itself, there are many things come from pineapples. These include not only pineapple chips but pineapple flavor, juice etc as well. Because there is a global market for pineapple products, these products can export from one country to another. Thus, one of your options is to go into pineapples cultivation when you are looking towards starting an agricultural based business in Bangladesh. From a seedling state to fruition stage, mangoes take time to grow. That’s why you must be patient enough to wait if you’re considering going into the cultivation of mangoes cultivation. The best thing about it is that you can be rest secure to harvest mangoes once or twice a year when the trees are up. This is another crop that has a worldwide demand and also in Bangladesh. Maize can process into various forms as a matter of fact. This is the crop that comes with the forms of gourmet, flour, and beers et al. It’s not only easy to cultivate maize but there is a large market for this crop. One of your options is to go into maize farming if you are looking towards starting your own farming business. It’s fish farming that’s another highly thriving and profitable business venture. This is for those who have the interest in making money from the agriculture industry, they should consider it. As fish consumes in all parts of the world, there is a large market for fish. Sugarcane also easy to cultivate and it brings good profits as the rewards. The business is most suitable for the people those who are living near the river areas of Bangladesh. And you can start this agricultural based business if you’re interested. A cattle farming is the business of livestock breeding, which is ideal for cows, ox, bulls, bullocks etc. As for meats, skins, milk, and manure et al are getting from cattle, it’s a big business. So, open a cattle ranch if you have the financial capacity.